Enabling notifications for GO SAILING is very easy, and can be accomplished by following the steps below. 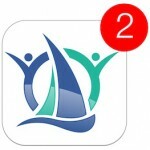 Without notifications you may miss important trip updates and messages, so take a moment to set up notifications for your GO SAILING app. Navigate your way to your “Notifications” as shown below (Settings -> Notifications -> Go Sailing -> Allow Notifications) and make sure “Allow Notifications” is turned on. Navigate your way to your “Notifications” as shown below (Settings -> Apps -> Go Sailing -> Show Notifications) and make sure “Show Notifications” is checked.